Summary: Learn how to use the SharePoint Foundation 2010 managed client object model to write applications that are based on the .NET Framework and access SharePoint content from clients without installing code on the server that runs SharePoint Foundation 2010. A team leader creates a SharePoint site that has many lists that are required to manage her team’s mission. She wants to change these lists in an ad-hoc manner—perhaps updating assignments and estimates based on an Open XML spreadsheet, or moving items from one SharePoint list to another. She wants to write a small custom application to help her manage this. A software company that sells a traditional rich client application wants to integrate SharePoint document libraries and lists into their application, and they want this integration to be seamless, or even invisible to their users. A SharePoint developer wants to build a rich Web Part for a SharePoint deployment that brings list content into their custom AJAX web code. He also wants to build an even richer Silverlight application that does the same thing. What do these people have in common? They can use the SharePoint Foundation 2010 managed client object model to achieve their goals. The SharePoint Foundation 2010 managed client object model lets you write client-side code to work with all the common objects in SharePoint sites. Through the object model, you can add and remove lists, add, update, and delete list items, change documents in document libraries, create sites, manage permissions of items, and add and remove Web Parts from a page. Previously, there were few options. You could use Web services to interact with SharePoint lists and other features, but this was challenging. If the Web services did not provide the necessary capabilities, you could write server-side code to provide a new Web service (an even more difficult task). Some IT departments disallow server-side code, or allow only code that is written by the IT department so that sometimes that was not an option. The SharePoint Foundation 2010 managed client object model enables new kinds of applications and makes it easier to write client-side code that interacts with SharePoint content. To use the SharePoint Foundation 2010 managed client object model (client object model), you write managed code based on the .NET Framework that uses an API that resembles the object model that is used on a server that is running SharePoint Foundation. The client object model has classes for accessing site collection information, site information, and list and list item information. 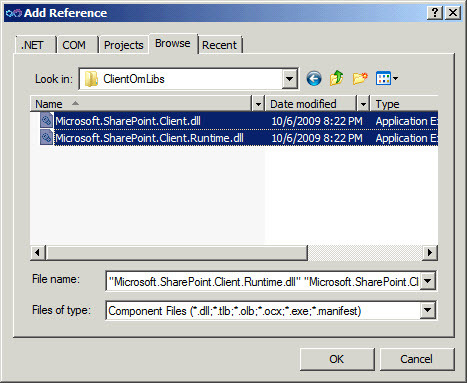 The SharePoint Foundation 2010 managed client object model consists of two assemblies that contain five namespaces. If you look at the classes available in those namespaces, you see many classes. Do not worry; many of those classes are used internally by the object model. You are interested only in a subset of them, primarily classes that have direct counterparts to some familiar classes in the SharePoint Foundation server object model. Notice that the SharePoint Foundation 2010 managed client object model uses the same legacy naming pattern for site collections and sites as the server object model. The Site class represents site collections, and the Web class represents sites. My preference for using these classes is to name the variables so that the variable name indicates whether it is a site collection or a site, even though you must use the Site and Web classes to declare them. The following example shows how I name variables. It is important to be aware that you control when the SharePoint Foundation 2010 managed client object model starts to send the XML to the server and receives the JSON back from the server. The bundling of multiple method calls into a single call to the server is dictated by the realities of network speed, network latency, and desired performance characteristics. If the SharePoint Foundation 2010 managed client object model interacted with the server at every method call, the performance of the system, and the increased network traffic would make the system unworkable. As I mentioned, you explicitly control when the SharePoint Foundation 2010 managed client object model bundles method calls and sends a request to the server. As part of this process, before you start the interaction with the server, you must explicitly specify what content that you want to retrieve from the server. This is the biggest difference between the SharePoint Foundation 2010 managed client object model and the SharePoint Foundation 2010 object model. But after you understand the model, it is not challenging. The easiest way to start understanding the difference is to see a simple application. I use Windows console applications for the sample code, but you can use the same approach with other application types. For SharePoint Foundation Beta and Microsoft SharePoint Server 2010 Beta, you must copy the two assemblies and put them in a convenient location on your development client computer. You must browse to those assemblies to add references to them when you are setting up projects that use the SharePoint Foundation 2010 managed client object model. To the right of the Recent Template pane, click Console Application. 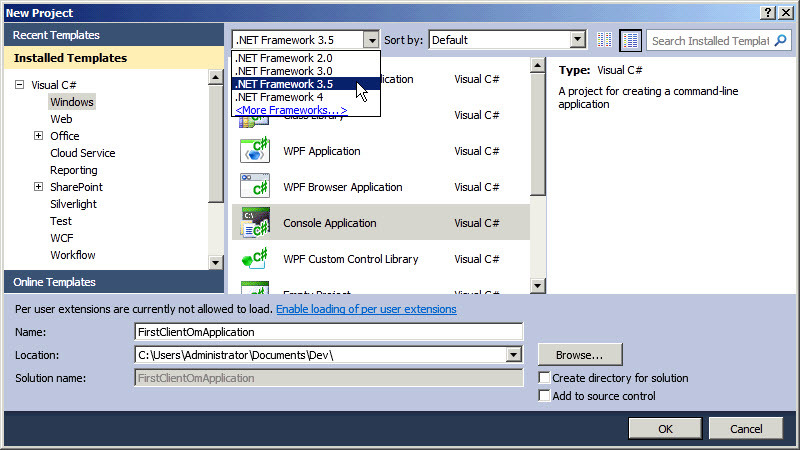 By default, Visual Studio creates a project that targets .NET Framework 4, but you must target .NET Framework 3.5. From the list at the upper part of the File Open dialog box, select .NET Framework 3.5. In the Name box, type the name that you want to use for your project, such as FirstClientApiApplication. The classes that you use in a client object model application are located in Microsoft.SharePoint.Client.dll and Microsoft.SharePoint.Client.Runtime.dll. As I mentioned, before you add the references, you must copy those assemblies from the server that runs SharePoint Foundation to the client development computer. On the Project menu, click Add Reference to open the Add Reference dialog box. Select the Browse tab, navigate to the location where you put the Microsoft.SharePoint.Client.dll and Microsoft.SharePoint.Client.Runtime.dll. Select both DLLs, and then click OK as shown in Figure 3. In Visual Studio, replace the contents of the Program.cs source file with the following code. Replace the URL in the ClientContext(String) constructor with the URL to the SharePoint site. Build and run the solution. The example prints the title of the site. Just as with the SharePoint Foundation server object model, you create a context for the SharePoint site that you want to access. You can then retrieve a reference to the site from the context. The call to the ExecuteQuery() method causes the SharePoint Foundation 2010 managed client object model to send the request to the server. There is no network traffic until the application calls the ExecuteQuery() method. An important point to make about this example is that the call to the Load() method does not actually load anything. Instead, it informs the client object model that when the application calls the ExecuteQuery() method, you want to load the property values of the siteCollection object. You inform the SharePoint Foundation 2010 managed client object model about the operations that you want to take. This includes accessing the values of properties of objects (for example, objects of the List class, ListItem class, and Web class), CAML queries that you want to run, and objects such as ListItem objects that you want to insert, update or delete. Then you call the ExecuteQuery() method. No network traffic occurs until you call the ExecuteQuery() method. Until that point, your application is only registering its requests. As you can see from this example, at its simplest, you first set up a query, and then you execute the queries. This causes the client object model to send traffic to the server and receive a response from it. This next section reviews the model in detail and shows why it is designed the way it is, and finally, how you can build applications by using the model. Before we delve into any of these subjects, let's examine the issue of object identity. The key idea behind object identity is that client objects refer to the corresponding in the SharePoint Foundation server object model both before and after they call the ExecuteQuery() method. They continue to refer to that same object through multiple calls to the ExecuteQuery() method. This means that when setting up the query, the client object model returns objects that you can use to further set up the query before you call the ExecuteQuery() method. This lets you to write more complex queries before you start causing traffic to and from the server. You can do more interesting things in a single query, and eliminate network traffic. The following example gets the Announcements list object, and then it retrieves all items of that list by using the simplest possible CAML query. First the code gets a List object by using the GetByTitle() method. Remember, this List object has no data in it; it does not have data in any of its properties until the application calls the ExecuteQuery() method. It then calls the GetItems() method on the list object, even though that list object is not populated with data. It finally calls the Load() method on both the list object and listItems object, and then calls the ExecuteQuery() method. 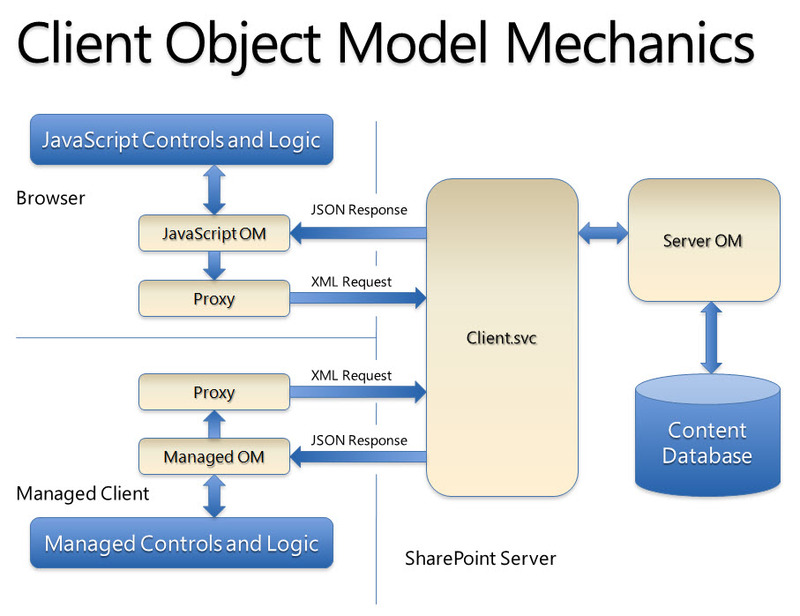 The key point about this is that the client object model remembers that the list object is the one that the application initialized by using the GetByTitle() method, and that the client object model should execute the CAML query on that same list object after the list object is retrieved from the SharePoint database. Any class that derives from the ClientObject class has these semantics. And, as mentioned, you can continue to use client objects to set up additional queries after you call the ExecuteQuery() method. In the following example, the code loads the list object and calls the ExecuteQuery() method. It then uses that list client object to call the List.GetItems method, and then calls the ExecuteQuery() method again. The list object retained its identity through the call to ExecuteQuery() method. Some properties and methods return objects or value types that do not derive from the ClientObject class. You benefit from using client object identity to access methods and properties only when those methods and properties return client objects or collections of them. For instance, some classes, such as the FieldUrlValue class and the FieldLookupValue class derive from the ClientValueObject class, and you cannot use properties that return those types until after the call to the ExecuteQuery() method. Some properties return .NET Framework types such as string or integer, and you also cannot use properties or methods that return those until after the call to the ExecuteQuery() method. Because you cannot use the values of any properties until those values are populated in the ExecuteQuery() call, you cannot, for example, find an item in a list, and use the value of one of that item’s fields to select items in an additional query. If you try to use a property before it is populated by the ExecuteQuery() method, the client object model throws a PropertyOrFieldNotInitializedException exception. Client object identity is valid only for a single ClientContext object. If you initialize another ClientContext object to the same SharePoint site, you cannot use client objects from one client context with the other one. A number of later examples in this article use object identity behavior. This example does not do any error handling. If the Announcements list does not exist, the client object model throws an exception in the call to the ExecuteQuery() method. You should be prepared to catch exceptions when you write code that may fail if you ask for objects that may not exist. SharePoint Foundation is often deployed in organizations with many thousands of users. When building an application that accesses SharePoint Foundation over the network, it makes sense to build it so that it uses the least amount of network traffic. There are several ways that the client object model helps you do this. The simplest approach is to use lambda expressions to specify exactly which properties the client object model should return to the application. The following example shows how to specify that when the client object model loads the site object, it must load only the Title property and Description property. This reduces the size of the JSON response from the server back to the client. By default, if you do not include these lambda expressions in the call to the Load() method, it loads a much larger number of properties (but not them all). The first two examples called the Load() method without specifying which properties to load, so that the JSON packet that the server returned was somewhat larger than it needed to be. Although in these small examples, it does not make much difference, when it loads thousands of list items, carefully specifying the required properties reduces network traffic. Using lambda expressions, you can specify a list of properties to the Load() method. Reducing network traffic is not the only benefit you derive from the client object model’s use of lambda expressions. Later on this article describes how to filter result sets using lambda expressions. Next, I’ll show an example that creates a list and then add some content to it. This will provide sample content to work with for the rest of this article. The following example creates a list, and adds some fields and several items to it. In many cases, where you can create a client object, the application can call an Add method that takes as an argument an object that specifies creation information. This example shows how to use ListCreationInformation class to create a List object, and how to use the ListItemCreationInformation class for creating a ListItem object. You often set properties of the creation information class after instantiating it. You can see that the code sets the Title property and TemplateType property of the ListItemCreationInformation object. Note that to create a list, you call the Add() method, but to create a ListItem object, you call the AddItem() method. The Add() method creates a list in the collection, and the AddItem() method creates a single list item. Creating fields in a list also does not use an Add method, because, when you create fields, you are not really creating an instance of the Field class. You are creating an instance of a class that derives from the Field class. There are many options available for those derived classes, and using an Add method would significantly complicate the design of a FieldCreationInformation class. For this reason, the client object model does not include such a class. Instead, the simplest way to create a field is to specify a bit of XML that defines the field, and pass that XML to the AddFieldAsXml() method. There is a Add() method that you can use to create a field, but instead of taking a FieldCreationInformation object, it takes another Field object as a parameter that it uses as a prototype for the field to be created. This is useful in some scenarios. The Discovering the Schema for Fields section of this article shows you an easy way to discover the XML that you must specify for fields that you want to create. Note that, of course, no objects are actually added to the SharePoint database until the application calls the ExecuteQuery() method. There is one more item of interest in this example. Notice that after you call the AddItem() method, the example sets three indexed properties. The code is setting the values of the fields that were previously added to the list. After setting these properties, the application must call the Update() method, informing the client object model that those objects were modified. The client object model does not work correctly if you do not do so. You see the Update() method used in later examples, when I show how to modify existing client objects. Now that you have some data, let us discover some interesting ways to query and change it. The following example shows how to use CAML to query the list that you created in the last example. This example prints the Development items from our test list. You may notice a difference between the lambda expressions that you specify in this example and the lambda expressions in the example that is presented in the Trimming Result Sets section. You must use the Include() extension method to specify the properties that you want to load for each item in the collection that we load. The items parameter of the lambda expression is of type ListItemCollection, which of course does not contain an indexed property that allows us to specify which properties to load for items in the collection. Instead, you call the Include() extension method, which enables us to specify which parameters of that child collection to load. Parameters to lambda expressions in the Include() extension method are of the type of the items of the collection. Therefore, you can specify the properties that you want to load for each item in the collection. If you are requesting that the client object model load certain properties of a client object (not a collection of them), then specify the properties in the lambda expression that you add directly in the Load() method. If you are requesting that the client object model load certain properties of each item in a collection of client objects, use the Include() extension method, and pass the lambda expressions that specify your desired properties to the Include() method. Never use the IQueryable<T>.Where extension method when querying ListItem objects. The reason is that the client object model first evaluates the result of the CAML query, retrieves the results, and then filters the resulting collection using LINQ. If you filter a very large list using LINQ instead of CAML, the client object model attempts to retrieve all items in the list before filtering with LINQ and either issues queries that require too much system resources, or the query fails. The reason is not clear unless you know how the client object model works internally. You must use CAML when querying list items. The following example queries the client object model for all lists that are not hidden. Notice that you must include a using directive for the System.Linq namespace. On my server, this example produces the following output. The LoadQuery() method is similar in functionality to the Load() method, except that in certain circumstances, the client object model can process the queries more efficiently and use memory more efficiently. It also allows for a more flexible programming style. The LoadQuery() method has different semantics than the Load() method. Whereas the Load() method populates the client object (or client object collection) with data from the server, the LoadQuery() method populates and returns a new collection. This means that you can query the same object collection multiple times and keep separate result sets for each query. For instance, you can query for all items in a project list that are assigned to a certain person, and separately query for all items that have an estimated hours that is larger than a certain threshold, and access both result sets at the same time. It also enables you to let these collections go out of scope, and thereby become eligible for garbage collection. Collections that you load using the Load() method are eligible for garbage collection only when the client context variable itself goes out of scope. Other than these differences, the LoadQuery() method provides the same functionality as the Load() method. The following example uses the LoadQuery() method to retrieve a list of all the lists in the site. Notice that the LoadQuery() method returns a new list collection that you can iterate through. The new list collection has a type of IEnumerable<List> instead of ListCollection. There is one aspect of the semantics of the LoadQuery() method that you must pay attention to. In the previous example, the original lists variable does not have its property values populated after the ExecuteQuery() method returns. If you want that list to be populated, you must explicitly call the Load() method, specifying which properties that you want loaded. When calling the LoadQuery() method, you can specify multiple levels of properties to load. This allows the client object model to optimize its access to the server that runs SharePoint Foundation by reducing the number of times the client object model must call to the server that runs SharePoint Foundation to retrieve the data that you want. The following query retrieves all lists from the site, and all fields from each list. It then prints them to the console and indicates if each list or field is hidden. This approach allows the server part of the client object model to be more efficient than if the application first loaded a list of lists, and then loaded fields for each list. The LoadQuery() method takes an object of type IQueryable<T> as its parameter, and this enables you to write LINQ queries instead of CAML to filter the results. This example returns a collection of all document libraries that are not hidden. Updating client objects by using the client object model is fairly simple. You retrieve the objects, alter properties, call the Update method for each object that you change, and then call the ExecuteQuery() method. The following example modifies items in the Client API Test List, increasing the estimate for all development items by 50 percent (a common operation). Deleting client objects is just as easy. However, there is one very important dynamic around deleting client objects from a client object collection. You cannot iterate through the collection, deleting objects. As soon as you delete the first object, it causes the iterator of the client object collection to malfunction. The iterator may throw an exception, or it may quietly finish but not visit all items in the collection. Instead, you must materialize the collection into a List<T> using the ToList method, and then iterate through that list, deleting the client objects. The following code example shows the incorrect approach. // The ToList() method call is removed in the following line. Finally, to clean up the Client API Test List, here is an example that deletes the list and its items. As promised, this section shows an easy way to discover the XML schema that you use to create the fields that you want to create in a list. First, on the SharePoint site, create a list that contains columns that are configured as you want them. Then you can then use the following example to output the XML that creates those fields. The following example prints the field schemas for the fields that I added to the Client API Test List. When you run this after you create the list by using the example program in the section Creating and Populating a List, it produces the following output. The example removes attributes that are not required for creating the field. SharePoint development guidelines indicate that you should not attempt to retrieve more than 2000 items in a single query. If this is a possibility in your application, consider using the RowLimit element in your CAML queries to limit how much data that the client object model retrieves for your application. Sometimes you must access all items in a list that may contain more than 2000 items. If you must do so, then best practice is to page through the items 2000 at a time. This section presents an approach to paging using the ListItemCollectionPosition property. // enough records to show paging. // This example shows paging through the list ten items at a time. Item Title: Write specs for user interface. Item Title: Write test plan for user interface. Item Title: Validate SharePoint interaction. Item Title: Develop user interface. If you are building an application that must attach to SharePoint sites that may not be available, or if you must regularly invoke queries that may take a long time, you should consider using asynchronous processing. This enables your application to continue to be responsive to your user while the query executes in a separate thread. In your main thread, you can set a timer to let you know if the query is taking longer than your desired threshold, you can keep the user posted with the status of the query, and when the query finally finishes, you can display the results. When building a traditional application that is based on the .NET Framework, such as a Windows Forms or WPF application, you may want to use asynchronous processing. The following example uses the BeginInvoke method to execute a query asynchronously. Notice that the code passes a statement lambda expression to the BeginInvoke method, which makes it convenient to create this pattern, because the statement lambda expression can refer to automatic variables in the method that contains it. You can see that the statement lambda expression has access to the clientContext variable and the newListCollection variable. Microsoft Visual C# closures make the language function as you expect. The example produces the following output. About to start a query that will take a long time. continue to be responsive to the user.